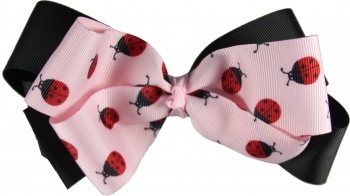 Double the ladybugs craze with this bow. Ladybugs crawling all over this pink grosgrain ribbon on the top layer and a solid black grosgrain ribbon is on the bottom. This is 30 inches of black ribbon and 22 inches of ladybug ribbon that is wrapped in boutique style and attached to a 2 and 3/4" French clip.